Modern data centers are complex, distributed environments. As a result, most organizations require a large number of disparate systems that store massive amounts of data for effective data center management. However, the different databases used to manage today’s data centers often lead to inaccurate data and reduced productivity from entering the same data multiple times, functional silos that hinder access to all available data, and a host of other challenges. How can data center professionals leverage information from IT service management (ITSM), configuration management databases (CMDBs), and other data center management systems to better correlate and gain value from their data? What can they do today to prepare for managing edge deployments, hybrid public/private clouds, and other modern data center environments? And how can Data Center Infrastructure Management (DCIM) software help? The ability to transform data center management tools and processes to create a single source of truth across the organization is what separates successful data center managers from those who continue to struggle. 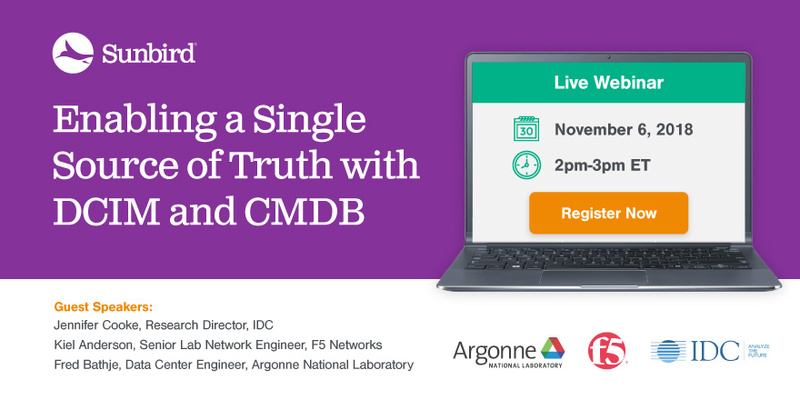 Join us for our next live webinar, “Enabling a Single Source of Truth with DCIM and CMDB,” on Tuesday, November 6 at 2 PM ET to explore what data center professionals can do to successfully break down data silos and improve integration across data center management systems make better, more data-driven decisions. Whether you have fully integrated DCIM and CMDB, are currently working to connect disparate systems, or are still stuck in silos, you won’t want to miss this webinar. You’ll gain the real-world, practical advice you need to effectively leverage information across disparate systems and better manage your data center. Register now to secure your spot. Jennifer Cooke, Research Director, Datacenter Management, IDC. Jennifer is an 18-year veteran of IDC and covers the worldwide market for datacenter infrastructure management (DCIM). She will share IDC research that highlights the present state of data center management and how data center infrastructure, management, and processes may transform to accommodate modern environments, including edge deployments. Kiel Anderson, Manager, Product Development Lab, F5 Networks. Kiel has been working in the data center environment since 2001. At F5 Networks, Kiel's experiences include the management of the power, space, and cooling infrastructure of customer-facing and internal production data center environments. Kiel will share his experience and subject matter expertise in integrating DCIM software with CMDB for smarter, more efficient data center management. Fred Bathje, Data Center Engineer, Argonne National Laboratories. Fred has spent the last five years managing Argonne's operational data centers, where he is responsible for the operations, management, maintenance, and support for multiple mission-critical facilities. Fred will share his perspective as a DCIM user considering the challenges and opportunities of integrating DCIM with a CMDB. James Cerwinski, Director of Product Management, Sunbird Software. James has more than 20 years of experience in designing, developing, and deploying management systems to improve uptime and efficiency of data centers, telecom central offices, and other IT infrastructure. At Sunbird, he works closely with our customers and engineers to develop our product roadmap. He will demonstrate real-world use cases for integrating DCIM and CMDB data for smarter data center management. Don’t miss your chance to learn from industry analysts and data center experts who can guide you through the challenges and opportunities of integrating DCIM and CMDB. Register today.